There is Marcus Foster. There is Perry Ellis. Both are the go-to, star players for their respective teams. Then, there is Nigel Johnson. Johnson has started just five games, averages just 4.2 points per game and has been scrutinized all-season long at point guard. Monday, however, he was the hero. 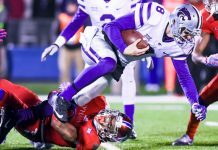 Of course, it was a team effort that helped K-State knockoff No. 8 Kansas 70-63. K-State’s seniors played like seniors, and three players finished in double-figures. 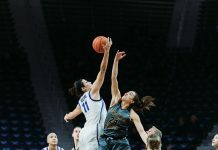 But it was Johnson’s career-high 20 points that lifted the Wildcats time and time again in another wild Sunflower Showdown. Even an hour after the game, Johnson still hadn’t been able to process his night. K-State (14-15, 7-9) and Kansas (22-6, 11-4) went back and forth for the full 40 minutes with neither team able to lead by more than eight points. With 9:50 remaining in the game, Johnson hit a 3-pointer to tie the game at 52. Two minutes later, he dribbled to the basket and finished a tough layup to put K-State up 58-54. The Wildcats never trailed again from that point. Seniors Thomas Gipson and Nino Williams, like Johnson, were monumental in the upset win. Gipson was a force inside, finishing with 12 points on 4-6 shooting. Williams hit a long 2-point bucket with 29 seconds remaining to ice the game. While Perry Ellis showcased his All-Big 12 talents early for Kansas, Johnson was the story of the first half for K-State. He scored 10 first-half points on 3-5 shooting. His offensive production was critical with Foster starting out shooting 25 percent from the field on eight attempts. Foster finished 3-13 from the field including 0-6 from behind the arc. Trailing 26-19, Johnson hit back-to-back 3-pointers in front of the Kansas bench. He later gave K-State their first lead of the game with a tough layup in between two Jayhawk post players. Kansas struggled to complete easy looks near the rim during the first half, but Ellis had no trouble carrying the team. The junior forward finished the first half with 15 points on 7-10 shooting to go along with four rebounds. He went on to score nine more points to finish with 24 on the evening. 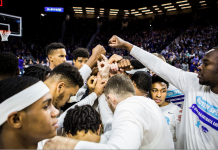 The Wildcats survived a second Kansas attempt to break the game open early in the second half. Kansas stormed out of halftime on an 11-3 run to take a 41-33 lead with 16:30 to play in the ballgame. Johnson responded for the Wildcats once again with a tough layup at the basket that saw him hang in the air before completing the shot off the backboard. He then sunk a 3-pointer, this time, in front of his own bench to tie the game 47-47 with 11 minutes to play. 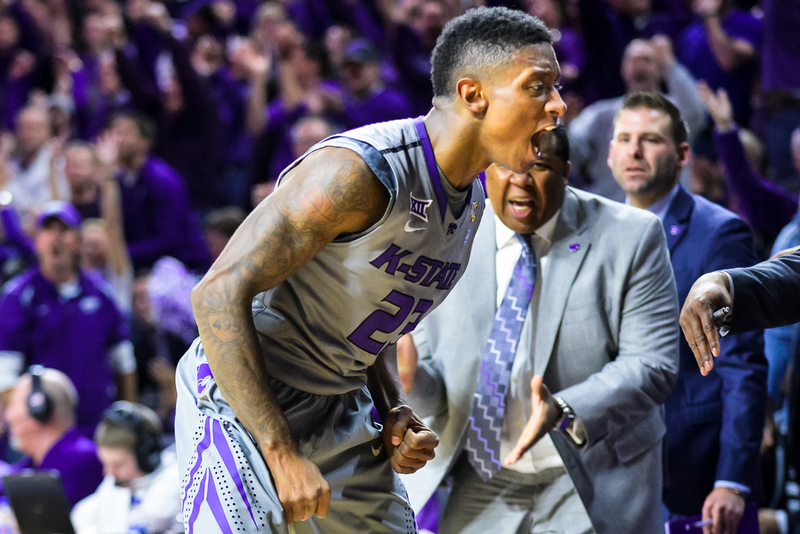 K-State has now beat Kansas in consecutive seasons for the first time since 1993-94. K-State returns to action on Saturday at home against No. 12 Iowa State, who is battling Kansas for the Big 12 regular season title. Tipoff is scheduled for 3 p.m.